Home » iPhone 5S » What's the difference between iPhone 5S and iPhone 5C? What's the difference between iPhone 5S and iPhone 5C? That's like asking, “What's the difference between a .44 Magnum and a BB gun?” But fine, I will indulge you and explain so you don't go ahead and make any rash decisions that will result in you buying an overpriced toy when you were aiming at a functional smartphone with the latest generation technology. There are many differences between the 5S and the 5C... Wait, scratch that, there are never “many” differences between Apple phones, but there are several distinct qualities that will appeal to one crowd or another. I will explore the various aspects of the phones that differ and let you make up your mind of which one you want to buy in the end (if any). Let's start with the price just to give you a hint of what I'm talking about. This is what in the Apple context you might call a “budget phone” (of course, outside the Apple context is still an extremely overpriced last-gen phone). The phone will ship for $549 for the 16GB version without a contract and $649 for the 32GB version, which as you can see is still a significant price. Of course, when you get a contract into the equation the phone will be significantly cheaper but you will have to pay your contract fees for a very long time. The iPhone 5S will cost you $100 more, with $649 for the 16GB version and $749 for the 32GB version. When you think about it, the difference in price is nothing compared to what you get for your 100 bucks more but if you're on a budget and want to have the cheapest new iPhone available and those $100 are stopping, then you can save them and still join the “cool kids” club. The performance is where the differences between the two phones really becomes painfully obvious. The 5S is Apple's new flagship phone while the 5C is basically a recycled and slightly better version of the iPhone 5. The 5S comes equipped with Apple's newest mobile processor – the A7, whereas the 5C packs the same processor as the iPhone 5 – A6. A7 comes with a new 64-bit architecture which drastically improves the processing power of the device without causing a faster battery depletion. Whereas the iPhone 5C is just as fast as the iPhone 5, the 5S is much faster. Also, the 5S comes with another processor called the M7 which will handle various operations connected to the phone's sensors, GPS and more, without waking up the main processing unit, extending the battery life and improving efficiency. 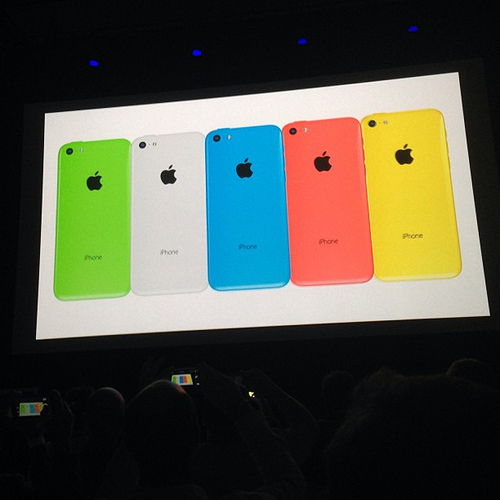 The main, revolutionary feature of the iPhone 5C is... color? That's right, folks, that's all the “new” model has to offer in terms of features is color! For the first time since the iPhone 4, Apple release a device with a variety of different colors, 5 to be precise - green, yellow, blue, white and pink, with “special” wallpapers matching your chosen color. Other than that, there is not much I can say about the 5C, except that it comes with iOS 7 – Apple's new mobile operating system, but since it will be available for older devices, as well, that's not really a novelty, is it? The 5S, on the other hand, makes a leap forward with the finger print identification embedded into the phone. No more remembering passwords and annoying PINs – swipe your finger across the home button (under which the sensor lies) and “Touch ID” will unlock your phone. You can store up to 5 finger prints in the phone, meaning up to 5 people can unlock it. This technology isn't only connected to the phone, however, but also to the app store, iTunes, etc. However, only one finger print can be used for shopping. The information is stored on your phone, which I imagine is in light of the privacy scandals from a few months ago. This is the next-level security. Rose Finchley is a tech freak. She loves all kinds of gadgets and she works at http://www.endoftenancycleaners.net/charlton-se7/when there is a problem with the cleaning machines she is the one who fixes it.